For many workers, accessing machinery and hardware during their daily activities can literally put them in a tight spot. There are several reasons to add Engineered Lift to your rotation device. Reduction in Overuse injuries – When workers must access equipment at awkward angles and bend their bodies into tight spots just to perform daily duties, they are at greater risk for overuse injuries. Allowing employees to work ergonomically can increase productivity and decrease worker’s compensation claims. By adding Engineered Lift to your rotation device you will gain access and cut down on these costs. Greater Access – You will gain greater access to specific parts of the equipment that you are working on, and allow improved ergonomics in the process. With ease of access comes more freedom to create and be productive. Better Vantage point – By enabling technicians the ability to view the entire surface of the equipment or machine, they will have a greater ability to diagnose and repair, run diagnostics and improve assembly. Reduce risk of damage to high value hardware – As workers strain and struggle to access areas of hardware that are working on, there is a risk that they will inadvertently damage it. With the ability to lift the hardware and gain access, this will reduce these risks. Asynchronous – Independent end frames support the payload, each carriage can be independently lifted or lowered and the spherical bearings allow for angular misalignment. Of course, this solution can be customized to allow for different length payloads or to accommodate a different height change range by modifying the rack lengths. It can be bolted to the floor, roll on tracks or be modified to be mobile on casters. Synchronized – If there is a concern that asynchronous lifting will induce undesired loads into sensitive hardware, synchronized engineered lift is the better option. This allows the user to operate a single crank to raise and lower both carriages simultaneously and within a fine resolution of one another. Flotron will work with the customer to engineer a solution that can accommodate the specific envelope, geometry and CG location of the payload as well as design custom interface hardware if required. 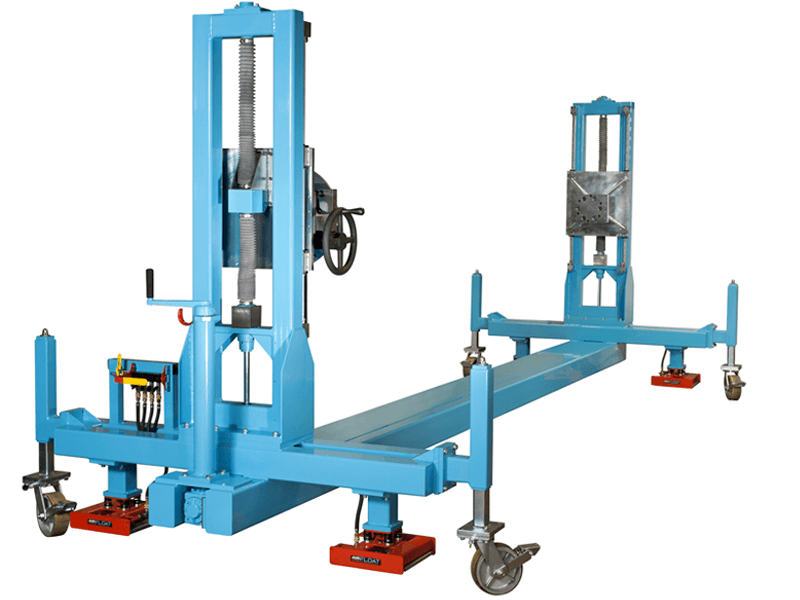 Long-Stroke Lift Jacks – Lift Jacks are the simplest vertical lift solution where the lift range is limited to about 13” and there multiple operators available to raise and lower simultaneously. Applications can range from vertically integrating a payload to gaining access for testing.